The temperature rising high and there is nothing you can do about it – the scorching sun and the sweat dripping down your nape. Can you think of any solution? Of course visiting a cool hill station is one way out, but a cheaper solution may be having a good, cold, long sundae. A little googling about sundae gave me more than 10 million links to sundae. 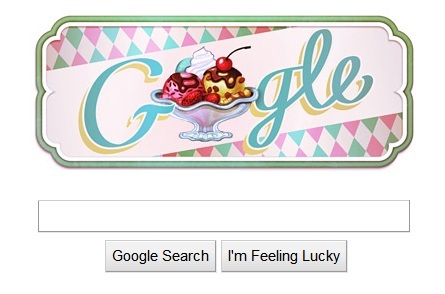 Google celebrated the 119th birthday of sundaes with a Google doodle, allegedly invented first by someone in Ithaca, N.Y, who also happens to be a pharmacist. Whether or not it’s someone from USA or from Uruguay, sundaes are everyone’s favorite, and for those who are calorie conscious, why not just indulge in some sin – sundaes on Sunday. Don’t forget to participate in the Father’s Day event happening at Cook Like a Bong. The last date of submission of all your entries is 15th June, 2011. You can send as many entries as you want . Send in your dad’s favorite recipes, your stories about your father, and any gift ideas for the day, or just send a photo of yours with your father – we’ll publish here on Father’s Day. And, for the Father’s loving child there will be a surprise gift announced for the best entry. So, send your entries quickly and enroll yourself to get a great gift from Cook Like a Bong. Do you think i can add some hersheys syrup instead of the wafers? There is no hard and fast rule to what you want to put in the sundae. Of course you can add Hershey’s syrup if you like. I have made this many a times with vanilla ice-cream. My family loves it!! Looks lovely Sudeshna, will definitely try this one of these days…..have tried a somewhat similar recipe with vanilla icecream, but never with butter-scotch…mangoes and butter scotch ice-creams both are my hubby’s favorite, so this should please him…will let you know the results of the effort ! wow..the sundae looks delicious..love the butterscotch flavour in it.. Thanks, Sowmya. Yes, I do love the butterscotch flavour, its just the best. How are you? Here after a long time and off blog most of the time. I like this presentation , I think I will eat all the individual ingredients rather than taking the trouble of arranging them. Jokes apart , awesome presentation indeed. I often cook your Mangsho kasha recipe, amazing! Nice to see Kalyan joining in ..After all engineers are great cook by training !! Thanks for dropping by. Its great to hear from you. Kalyan has started cooking. Have you checked out his rajbhog recipe? It turned out awesome. Wowww.. looks so yummy and perfect ! !